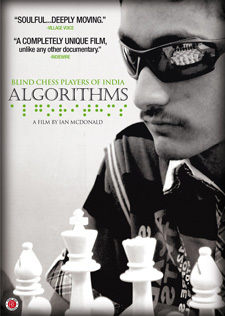 Filmed over a period of three years, “Algorithms” is a documentary about the world of blind chess in India. It looks at three boys from three different places in India and a blind pioneering chess player who wants all blind children to play chess. 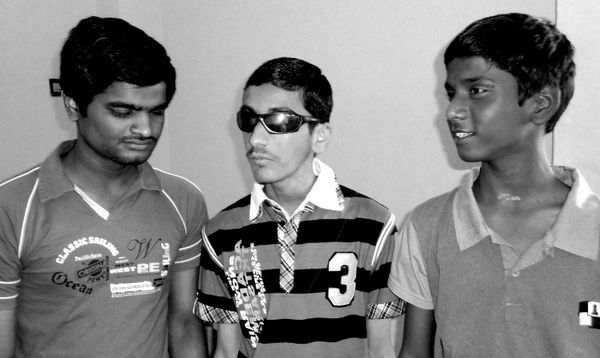 Anant, age 16, and Darpan, age 15, are totally blind, and 12-year-old Sai is partially sighted. Filming in black-and-white, first-time filmmaker Ian McDonald in his debut film follows the boys as they compete first in Blind Chess competitions in India, and, later, in matches in Sweden and Serbia. Each of the boys comes from a family of devoted parents who totally trust chess mentor Charudatta Jadhav, who went blind as a teenager and who then became a legend in the chess world. He is obsessed with building an Indian world champion and we really see that when the boys go a competition in Greece. The three boys represent different regions and socio-economic backgrounds and also varying levels of sightedness. Darpan and Anant are fully blind, SaiKrishna (the youngest of the three) can currently see but is losing his sight. Each family explains how their child came to lose their sight and their worries for their sons’ futures. It is important to note that the parents have not the case of Anant that his parents do not see the same value in chess that they see in education as a way out of poverty. All three come from families that are loving and caring. 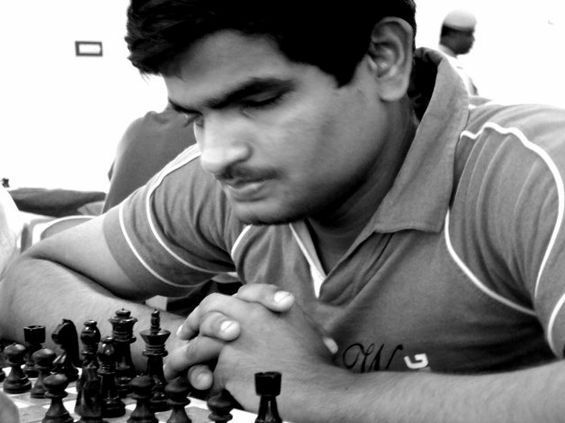 Charudatta ‘Charu’ Jadhav is a chess champion and he is blind. He is the man who mentors the three young players through the championships. He speaks quietly but he is also very direct with them. He wants to develop the infrastructure of the sport within India so that every blind child will have the opportunity to learn to play chess – a game played in the mind. Chess is a game with a level playing field between the blind and the sighted and those that have talent will be taken care of. The director chose the word “algorithms” for the titles of this film because it fits both chess and blindness. An algorithm is one method of calculation, a finite set of procedures or actions leading to an end state. We see the boys as they memorize entire chess matches knowing that to learn to think three or four moves ahead in order to outmaneuver their opponents. This is especially seen in the level of pre-planning involved in navigating the world without sight. Director McDonald emphasizes the tactile nature of the visually impaired by emphasizing surfaces – walls, skin, eyes – through close-ups but also in the way that the black and white photography treats textures. (The film was originally shot in color but during the editing process it was decided that the film is most effective if color is not used). The adapted tactility is really brought to the fore when we see the boys playing chess (There are pegholes for the pieces to sit in, the black squares are raised, and the black pieces have a small nub on the top). It is further emphasized by the looks on the boys’ faces when they play. Like everyone else, the boys have their ups and downs around the chessboard but McDonald shows that each boy follows his own way. No judgment is passed. Charu tells us that we learn more when things go wrong, and his young charges win and lose with equal grace – as the boys say to each of their opponents, “well played”. “Algorithms” is possessed by chess—the strategies, the wins, the losses, the material nature of the boards, and pieces themselves, as blind players experience the game in a completely tactile way. But it’s also a way to explore the lives and the worlds of its subjects, from different backgrounds in India, all working and striving for the same thing: victory. In many ways the film follows a traditional competition story narrative. We see matches and victories and losses leading up to the big game, training, pep talks, colorful competition, and grace in both defeat and victory. McDonald acts as more of an observer allowing scenes and interactions to unfold naturally, but taking the camera deeper and deeper into the experience. The result is a film that is engrossing in its approach to depicting the rhythms and nature of the game while at the same introducing us to four very special people. This entry was posted in Film on February 12, 2015 by Amos.